Customization is an interesting thing when it comes to computers. For a while, just being able to swap out parts and components was as custom as you would get. This did not stop users from painting their cases, adding internal lights, and making it look nice. However, with Cooler Master's continuous campaign to "Make it Yours", it is no wonder practically all of their current products have some sort of customization in it. Today is another interesting case, but it is not anything new. Considering it was already showed to us at CES in January, it was just a matter of time when it would show up at our doors. Today we are taking a first look at the Cooler Master MasterBox 5, a more budget friendly case with a lot of ways to make it your own. 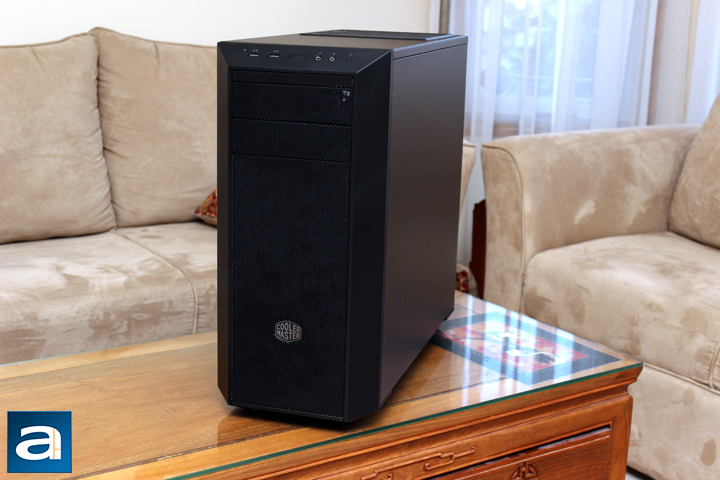 Let us see what Cooler Master has delivered to us in today's preview. Our unit came not via our traditional direct from Cooler Master's offices in USA, but rather from one of the Canadian retailers, in Richmond, BC. While we did not necessarily get an exact indication which retailer, it is probably not hard to guess who Cooler Master worked with to get them to our doors. Thankfully the box, which is also the retail container, came in good condition. The box otherwise is quite plain and unlike the Cooler Master MasterCase 5, this is just a standard brown corrugated cardboard box. However, it does follow a similar design language, with Cooler Master's font and styling of the case on the front. Some features are listed on the box, but if you cannot see it, we have posted it below for your perusal. The Cooler Master MasterBox 5 takes a lot of similarities from the MasterCase 5, but cuts it down for a smaller footprint. You can see a similar front panel, with the half-hexagonal look, and all the inputs and outputs right there. This includes an HDD activity light, two USB 3.0 ports, a power button, two 3.5mm audio jacks, and a reset switch. Otherwise you can also see Cooler Master has included two slots for 5.25" drives. While optical drives are sort of a dying trend, it is nice to see the ability to still support these optical drives nonetheless. The MasterBox 5's front panel is not a solid panel, but rather a mesh grid. This allows for adequate airflow directly at the front of the case. The panel also opens up differently than usual cases. Rather than removing the entire front, you only remove the middle mesh areas. By doing so, you can install fans much easier, since it does not require the full removal of the front. 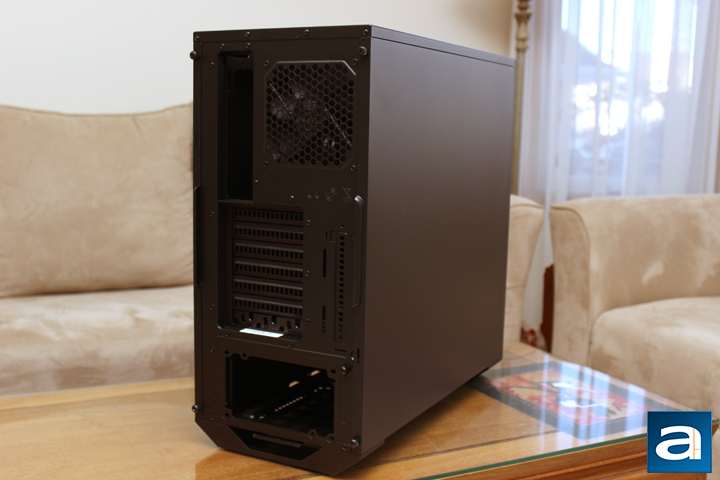 This front allows for a maximum 280mm radiator or two 140mm fans to cool down the case. Just to note, this will only work with a radiator thickness of less than 50mm. You can also purchase an additional fan bracket to increase the radiator compatibility size to 360mm. 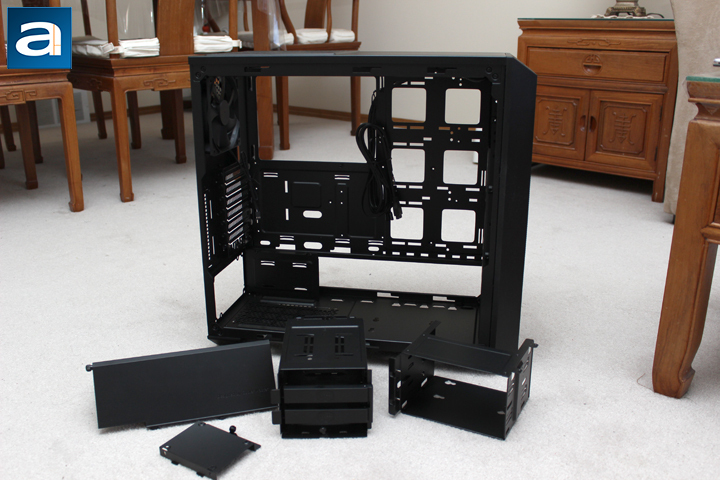 This is just the beginning of Cooler Master's optional parts to add on to the case, as you will see throughout this first look. Otherwise, the removed mesh panel also has a finer filter to ensure no dust enters through this area. From the back you can see there is a pretty standard layout. 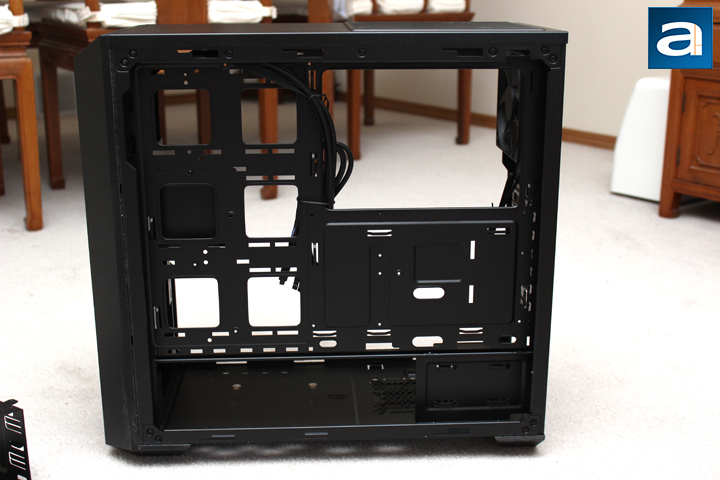 The back has the motherboard cutout placed at the top of the case, with a radiator to hold a 120mm exhaust fan. Cooler Master includes a single fan here to help with airflow. In addition to the front panel fans an the rear exhaust, there is also a top ventilation area to allow for extra fans to mount. This can fit an additional single 120mm or 140mm fan or radiator, depending on the user's need. There are a total of seven slots for expansion cards, which is pretty standard for a case of this size. However you may notice one of these expansion slot covers is not like the others. While it is not a pretender, the bottom metal cover is actually what Cooler Master calls their StormGuard routing, which allows users to wire their peripherals, and secure it inside the case through metal guides. The side panels are held to the Cooler Master MasterBox 5 with thumbscrews. It should be noted these panels are swappable, which is nice to see. 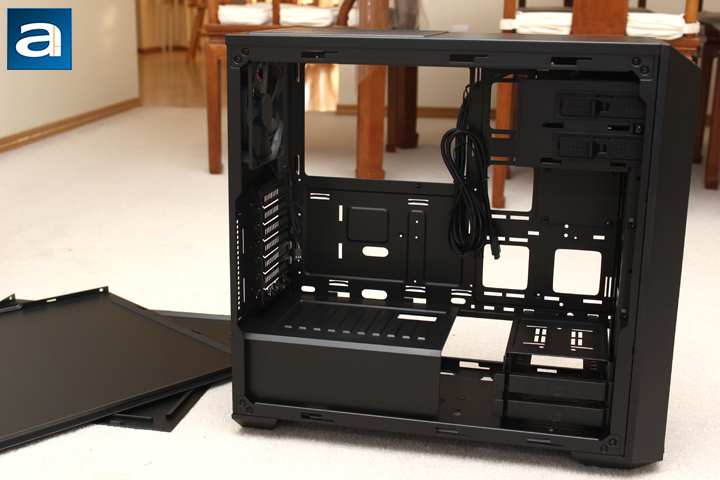 In addition, Cooler Master does have additional panels, including one with a large side window. This will allow you to show off your internal components. Otherwise, as you can tell from the inside, we have a standard mid-tower ATX case, with the capability to hold a motherboard from as small as an mini ITX to the larger extended ATX form factor. 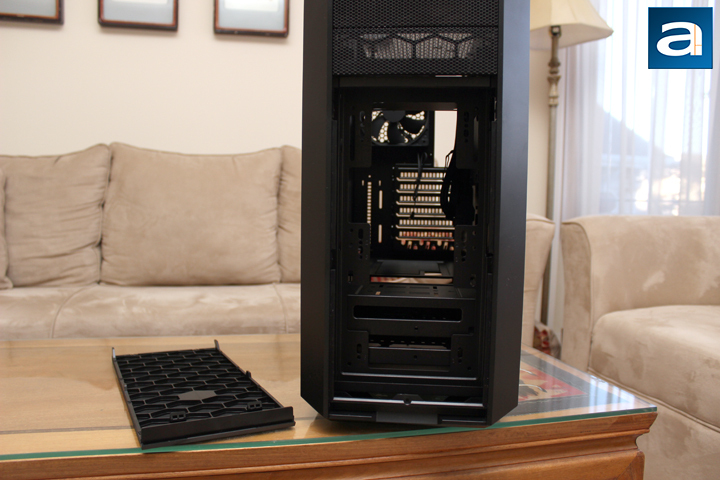 The case is wide enough to fit CPU air coolers as tall as 167mm, which should be good for most larger heatsinks. In addition, graphics cards of up to 410mm will fit, assuming there is no front storage drives mounted there. With a drive cage mounted in the least optimal position, the graphics card options shrink to 285mm, which is smaller but still quite capable for a lot of expansion cards. Flipping the Cooler Master MasterBox 5 around, we have quite a few things to note when it comes to routing. As this chassis is meant to be capable for holding all types of internal configurations, Cooler Master has ensured there is enough cable routing options no matter what. Thus you can see six cable holes, in addition to all the smaller holes all over the back plate. Also there is a huge motherboard cutout to accommodate for the multiple motherboard sizes. The bottom is opened up to allow for the power supply to sit in this area, while routing the power cables behind and through the holes. There is also quite a lot of cable tie points, which is another great thing to see. Spacing in the back is also quite excellent, with at least 25mm cable space in all areas, and up to 35mm in other select places. This should be quite adequate for most users, even if they are new to tidy cabling. Finally we come to what I think is the main point of the Cooler Master MasterBox 5. As you can see, Cooler Master has practically made the entire internal layout modular, with items from the PSU shroud, to the multiple drive and storage cages adjustable. This not only allows for various placements, but also for additional parts to be added later on. Other available parts include drive cages, in addition to the aforementioned front fan mounts and windowed side panel. You might wonder who would find this useful, and I would argue practically everyone would find this important. With the already included accessories of a dual-bay 3.5" drive cage, a dual-bay 2.5" drive bracket, a dual-bay 5.25" cage, and a power supply cover, this should appease the standard user, letting them move around or remove different parts depending on their needs. Then for enthusiasts and gamers, removing the unused drive bays or moving them away from the front will let users mount their larger liquid coolers. As for those who need more storage, such as content creators, the ability to store up to eight hard drives with additional 3.5" drive bays is also an option. 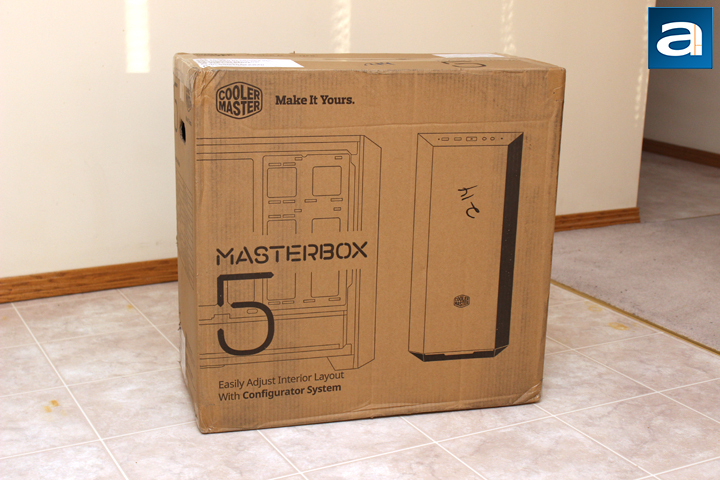 Thus it is quite obvious Cooler Master has thought of multiple target audiences with the MasterBox 5. Do you have any comments or questions about the Cooler Master MasterBox 5? Drop by our Forums. Registration is free, and it only takes a minute!